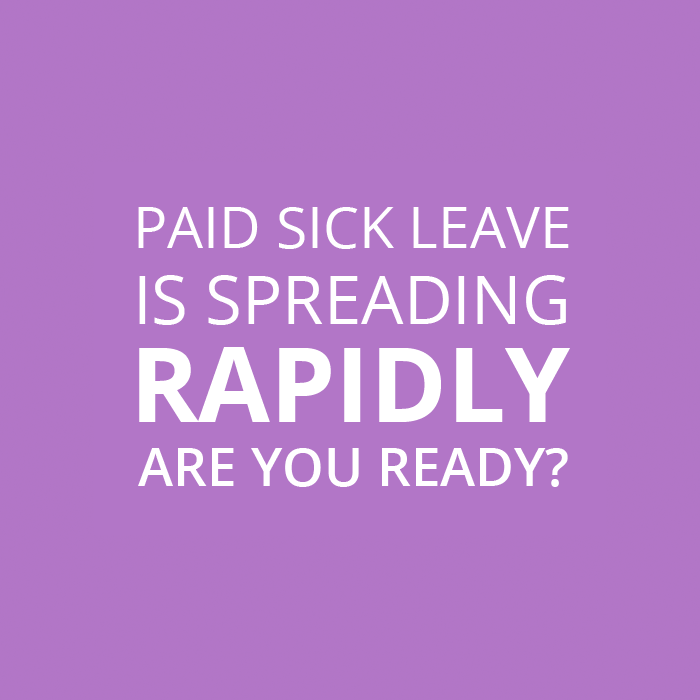 Paid Sick Leave is Spreading Rapidly - Are You Ready? Employees that clock-in while sick (AKA presenteeism), ultimately cost U.S. businesses upwards of $150 billion annually (Harvard Business Review). This is a staggering statistic, and worth noting. Sick employees generally perform at reduced levels of productivity, they typically make more mistakes, and they usually spread their illnesses to other workers. Given that most states don't require paid sick leave, workers oftentimes feel pressured to push through (despite common sense saying STAY IN BED). Thankfully, over the past few years, many states and municipalities have started addressing this issue by enforcing paid sick leave laws. These laws mandate that employers give workers paid time to recover from an illness or care for sick family members. Therefore, if you're a business owner or manager here in the United States, I strongly encourage that you verify compliancy in terms of how you are paying your employees. In two states above, Rhode Island and New Jersey, the new laws will go into effect later this year. Make sure to review the laws carefully, as they often vary between states. If your state hasn't made the list yet, trust me, it's only a matter of time. As a way to comply with these new laws, businesses must update their time and attendance systems. If you're using Webtimeclock, we've made it easy for managers to enter sick leave time. Once you log in, simply click on an employee, go to accruals, and input their sick time settings. But what exactly do you put in this section? It all depends on the state you live in. For example, let's suppose you're a manager working in California. The state legislation requires that for every 30 hours worked, employers must give 1 hour of paid sick leave. Therefore, using our system, you set Sick Time accrual to per "Hour Worked" and the amount Accrued will equal 1/30 or 0.033333. This means that for every hour you work, you earn 1/30 hours of sick time. If for example you live in Connecticut, where the accrual rate is one hour for every 40 hours worked, you will input 1/40 or 0.025. For small businesses (1-14 employees), employers must give one hour of paid sick leave for every 30 hours worked, with an accrual capped at 24 hours. For large businesses (15 or more employees), employers must give one hour of paid sick leave for every 30 hours worked, with an accrual capped at 40 hours. Accrual starts at the beginning of employment, and sick leave hours may be used 90 days after the start of employment. All businesses must give one hour of paid sick leave for every 30 hours worked, with an accrual cap of 48 hours. Employees may use 24 hours (3 days) of paid sick time in a single year. Accrual starts at the beginning of employment, and sick leave hours may be used 90 days after the start of employment. For any business with 50 or more employees, employers must give one hour of paid sick leave for every 40 hours worked, with an accrual cap of 40 hours. Accrual starts at the beginning of employment, and sick leave hours may be used 680 hours after the start of employment. For small businesses (1-14 employees), employers must give one hour of unpaid sick leave for every 30 hours worked, with an accrual capped at 40 hours in one year, however, employees may earn a maximum of 64 hours over time, and may use 64 hours of paid sick leave in a single year. For large businesses (15 or more employees), employers must give one hour of paid sick leave for every 30 hours worked, with an accrual capped at 40 hours in one year, or 64 hours over time, and employees may use 64 hours of paid sick leave in a year. Accrual starts at the beginning of employment, and sick leave hours may be used 106 days after the start of employment. For small businesses (1-10 employees), employers must give one hour of unpaid sick leave for every 30 hours worked, with an accrual cap of 40 hours. For large businesses (11 or more employees), employers must give one hour of paid sick leave for every 30 hours worked, capped at 40 hours. Accrual starts at the beginning of employment, and sick leave hours may be used 90 days after the start of employment. All businesses must give one hour of paid sick leave for every 30 hours worked, with an accrual capped at 40 hours. Accrual starts at the beginning of employment, and sick leave hours may be used 120 days after the start of employment. For small businesses (1-9 employees, if you live in Portland: 1-5 employees), employers must give one hour of unpaid sick leave for every 30 hours worked or one and one third hours for every 40 hours worked, with an accrual cap of 40 hours. For large businesses (10 or more employees, in Portland: 6 or more), employers must give one hour of paid sick leave for every 30 hours worked or one and one third hours for every 40 hours worked, capped at 40 hours. Accrual starts at the beginning of employment, and sick leave hours may be used 91 days after the start of employment. Rhode Island - Effective as of July 1, 2018. For small businesses (1-17 employees), employers must provide unpaid sick leave, where employees are allowed to use 24 hours of sick leave in 2018, 32 hours in 2019, and 40 hours in 2020. For large businesses (18 or more employees), employers must give one hour of paid sick leave for every 35 hours worked, with an accrual capped at 24 hours in 2018, 32 hours in 2019, and 40 hours in 2020. Accrual starts at the beginning of employment. All businesses must give one hour of paid sick leave for every 52 hours worked, with an accrual capped at 24 hours in 2018 and 40 hours starting in 2019 and beyond. Accrual starts at the beginning of employment. All businesses must give one hour of paid sick leave for every 40 hours worked. Accrual starts at the beginning of employment, and sick leave hours may be used 90 days after the start of employment. For small businesses (1-24 employees), employers must give one hour of paid sick leave for every 87 hours worked, with an accrual cap of 24 hours (3 days). For mid-sized businesses (25-99 employees), employers must give one hour of paid sick leave for every 43 hours worked, with an accrual cap of 40 hours (5 days). For large businesses (100 or more employees), employers must give one hour of paid sick leave for every 37 hours worked, with an accrual cap of 56 hours (7 days). Accrual starts at the beginning of employment, and employees may use accrued sick leave 90 days after the start of employment. Important to note: individual cities and counties may have paid sick leave laws that differ with the state laws. For example, the required accrual cap may be larger or unlimited, employees may use more hours in a year, or the parameters of the size of the business may vary. Please check the laws of your local city and county to ensure full compliancy. And REMEMBER, if you're unsure of which laws to follow (whether state or city), always choose the more generous of the two! Disclaimer: The information posted here is to be used as a guide (we are not lawyers!). ALWAYS check with your individual state, county, and city resources to verify all upcoming/changing laws.